Hi! I’m Cristy Burne, author of the Takeshita Demons books and Star Author for July. July is almost over, so it’s time to announce the winner of our Make a Monster competition! We had some incredibly creative and spooky and funny entries, so THANK YOU! …a copy of Takeshita Demons, the first book in my series of spooky adventures featuring Japanese demons. What is Takeshita Demons about? 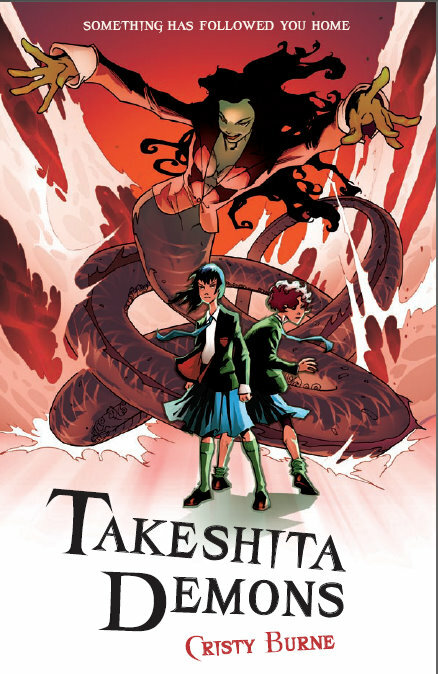 Miku Takeshita knows she’s in trouble when her relief teacher turns out to be a nukekubi cut-throat demon – a bloodthirsty creature who can turn into a flying head and whose favourite snack is children. That night, in a raging snowstorm, Miku’s little brother Kazu is kidnapped by the demons, and then it’s up to Miku and her friend Cait to get him back. The friends must break into their snow-locked school, confront the dragon-like Woman of the Wet, and outwit the faceless Noppera-bo. At last, they come face to face with the Nukekubi itself – but will they be in time to save Kazu? Well, the competition was a really close one. Everyone’s entry was creative and funny and many were incredibly gross as well (thanks!). You all produced demons to be proud of: what crazy, wonderful creatures! I hope you can use your creations in your own spooky stories and I look forward to reading your stories one day…perhaps on this blog? …and strangely, both of our winners are called Sophie! So congratulations to Sophie (and the HobbleGobble demon), and to Sophie Yeoman (and the Oglesmock demon). Your demons were terrifically funny and scary at the same time: we loved them! Zac from the blog will get in touch with you about your prize very soon. So that’s it from me and the month of July. WELL DONE to everyone who entered the make-a-monster competition… Your demons ROCKED and you do too! Like The Filth Licker on Facebook!